Auger boring is a technique for forming a horizontal bore hole through the ground, from a drive shaft to a reception shaft, by means of a rotating cutting head. The cutting head is attached to the leading end of an auger string. Soil is transported back to the drive shaft by the rotation of helical-wound auger flights within the steel casing pipe. The Guided Boring Method (GBM), also referred as Pilot Tube Micro-tunneling (PTMT), utilizes small diameter tubes (pilot tubes) that are installed and steered through the ground by utilizing a slanted face at the cutting head containing a target with light emitting diodes (LEDs) and a camera mounted theodolite that is located in the shaft to achieve high accuracy in line and grade. 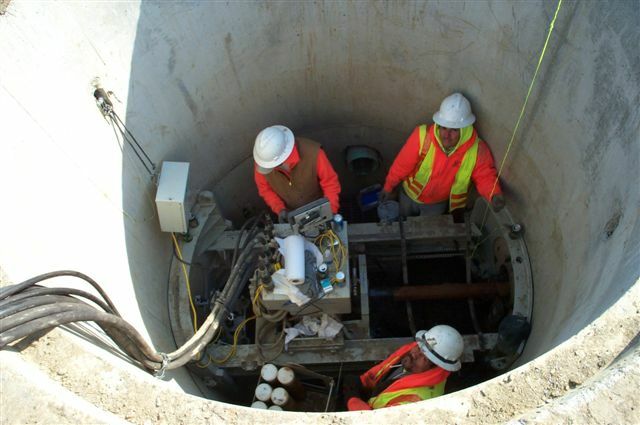 The hole is enlarged to the same outside diameter of the final product pipe after the installation of the pilot tubes and the pipe is either jacked or pulled into place.